One of George’s friend is a back yard chicken farmer. He also has a veggie garden about the size of mine so I was surprised the other day when he complimented me on the collards and said he was just not able to get them to grow anything like mine. He’s an old Florida guy who’s been doing this sort of thing for years and I just took it for granted that you planted collard seeds and then harvested them until you were totally tired of them so I was surprised by the comment and told him to pick all he wanted since I needed the space and only expected them to last another month at the longest. He came back and loaded up two giant bags so I was happy to get the space. He also brought a dozen eggs which was a fine transaction for us and admired the zucchini so maybe we can put together another veggie for protein swap. When Nancy does her quilt meetings on Tuesday, I kill those couple of hours at the library so I’m catching up on years of reading. One prolific author I like is Michael Connelly who I’m reading at a one book per week rate. I discovered that I have a fellow library patron Connelly fan I’m visualizing as an English Professor. I make that speculation because this person is very critical of Connelly’s grammar and with a very fine, red pen, scratches out mistakes and writes in the correction. I’ve now read 3 or 4 books that he/she has edited and to the best of my ability, those corrections are valid. It seems a bit of an anomaly that someone who reads fast paced detective novels would be so concerned about the grammar but …………. I’d love to see who the mysterious editor is. it’s beach week. The weather forecast looks great. It’s been windy for the last couple of weeks so I’m hoping that goes away so I can fish the surf to my heart’s content. We missed this trip last spring with some health issue so the place owes me some extra fish. The pic of the shark was caught this AM after about 1/2 hour of fishing. 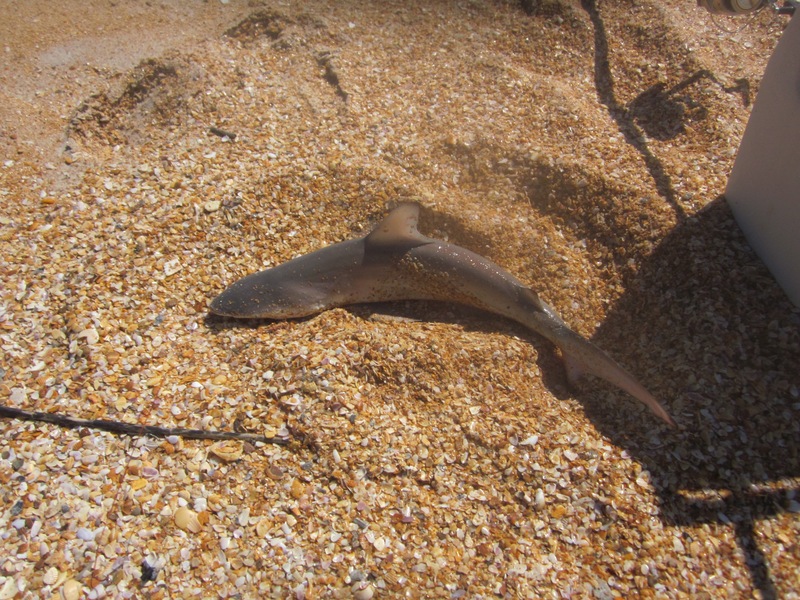 It’s a small black tip, about 2’ long. I’m hoping the blue fish start soon. It’s late in the season but you never know. The other pic’s are flying parachute kind of critters. There were about half a dozen of them swooping and soaring all around me. Looks like fun. One thing for sure, I broke the code on growing squash this season. We’ve already picked more, way more, this season than ever before. It’s a Utah like crop. I’m 99% convinced it’s the ultra early start inside the hot caps. The problem has always been critters that are waiting in the wings for the first squash to appear but by starting the plants a month early, the bugs haven’t yet mustered an attack. There are even several acorn squashes but the judge is still out on those. Zucchini are producing about 45 days after planting whereas acorns take more like 90 days so there’s still plenty of time for the bugs to go on the offense. Ditto New Zealand Spinach, aka Tetragonia, which has taken on a weed like status in the garden with virtually uncontrolled growth. I need to trim it with a lawn mower. The big question with that is whether or not it will handle the summer heat and humidity. Tried a new pizza combination last night – zucchini and tetragonia. Yum????????? Incredible. Then Nancy made a zucchini parmesan tonight. Excellent. Can a few loaves of zucchini bread be far behind? Chris made it to Walnut Creek a day ahead of his furniture and car. Smooth sailing the whole way. The moving van arrived right on schedule and the car at the same time, a day early, so by noon on Thursday he was living the good life. He’s totally satisfied with the apartment and the location which is within easy walking distance to BART and to one of his stores. You can check it out online by googling Brio Walnut Creek. His model is the 2BR, 2bath split plan. Very impressive amenities. How about daily valet trash pickup. Big time rain today which is supposed to be repeated for the next couple of days. I was hoping for a quarter of an inch to keep the new seeds I planted moist but what we got was 3”. I’m getting bad vibes about this rainy season – since it hasn’t officially started yet. Maybe I should start looking into rice horticulture. 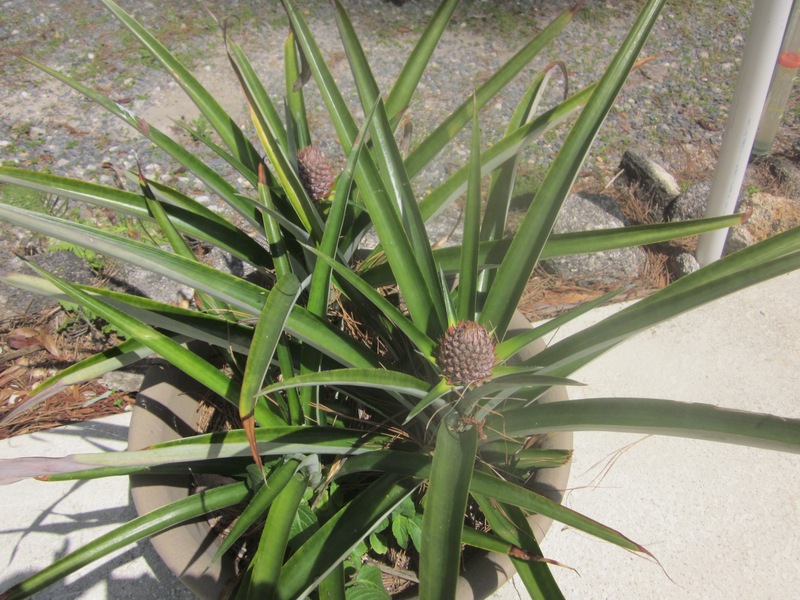 Big Ag news – the first two pineapples I started have little baby pineapples going. I didn’t log the event but think I planted them about 18 months ago. What I don’t know (yet) is whether the main plant remains to produce more fruit after I pick the pineapple or whether it’s a one time event. Interestingly there was a sale on pineapples at a local market last week and I bought 10 at $1 each. I didn’t save the tops to plant because the returns are minimal for so long a time in the garden. I cut the pineapples up and put them in the freezer to make smoothies for about 6 months. I noticed wet ground on top of the drain field which is not a good sign. The lake is particularly high which I’m sure contributes. Also it’s shaded by a couple of large oak trees so it never gets direct sunlight. So my first course of action is to clear the trees and see if that permits enough sunlight to dry it out and help grass grow. George has all the appropriate gear and skill set so we took a few hours off working on Garret’s place to cut some trees and boost the stock of firewood. My real thought is that we’ll provide have to have the septic tank pumped out and maybe some work done on the drain field. They’ve been in for 15 years so I guess it’s to be expected. Great progress this week on Garret’s house rebuild culminating in a concrete pouring day. George has a large cement mixer – a load uses an 80 pound bag of cement, 2 x 5 gallon buckets of sand and 3 x 5 gallon buckets of gravel. We ended up pouring at least 20 loads to fill a foundation 30’ x 2’ x 2’. We had help from a couple of young, strong backs but still was still an exhausting day. So the ground floor is basically done from a structural basis – all new support posts and the concrete stem wall. That should be the worst of it from a physical labor standpoint. I think putting the walls up downstairs is the next phase of the project. Our South Carolina nieces and their families took a Disney cruise this past week. 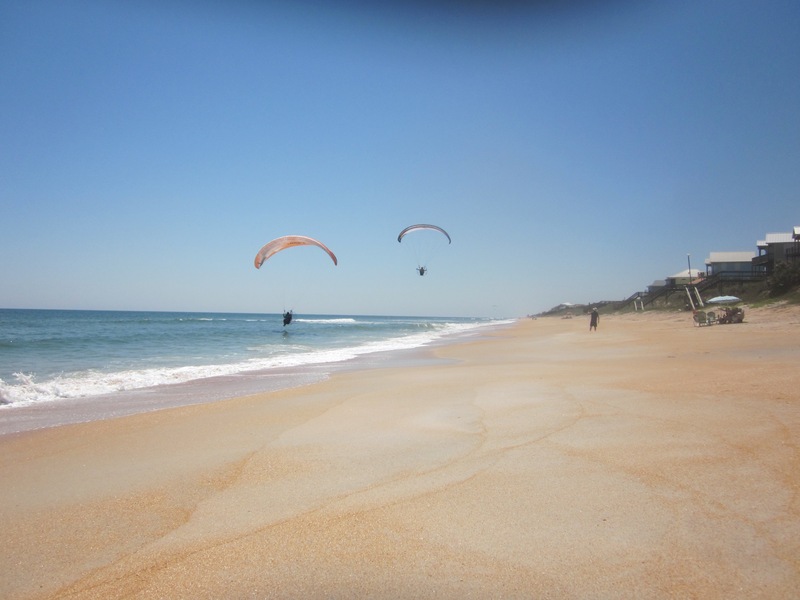 We got to spend an afternoon with them at the beach on the way down to the ship and then they stopped by at the lake for a brunch on their way home to South Carolina. So we had one niece, two great nieces, and three great, great nieces all at the same time. I managed to offload copious quantities of garden greens so we know they’ll be eating healthily for at least the next week. Most just stayed a few hours but Lindsay, Charles, Grace and Elizabeth stayed overnight so we got in some dock fishing as well. Chris report – left Chicago Saturday AM and made it to Omaha that evening. Plans to make Denver or Cheyenne Saturday night and then to Salt Lake on Sunday. Not sure how much time he’ll spend there but think the moving truck is scheduled to arrive in Walnut Creek on Tuesday so I’m sure they’ll be there to greet it.